Trying to keep track of new movies, TV shows, weather, and everything else in life can be sometimes a real pain. 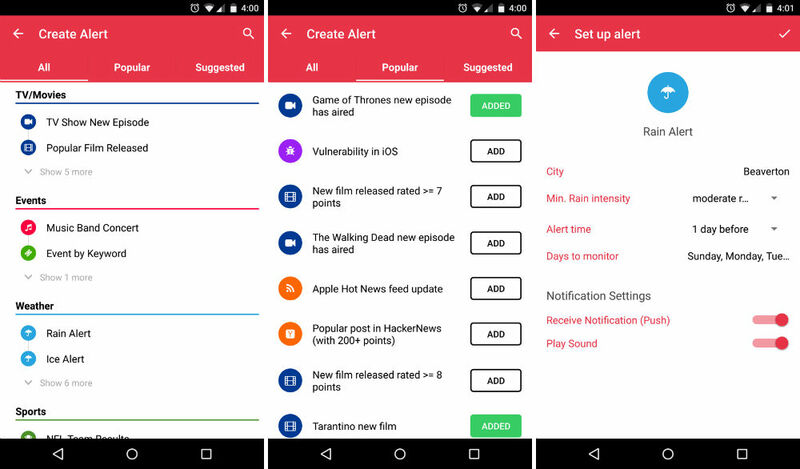 Thanks to a new app available for Android called Hooks, you can notified about a great deal of things, all from one single application. For example, you can set notifications for when a new episode of Game of Thrones airs, or when a new Quentin Tarantino movie is released. Additionally, users can set alerts for upcoming weather in the area, track incoming packages from a large amount of couriers (FedEx, UPS, etc), and a ton more. These examples don’t even break the surface of what kind of notifications you can receive. On top of the usefulness, the app looks and feels great, utilizing Material Design to the fullest. Adding notifications is smooth and seamless, thanks to the floating action bar. The dedicated pullout bar lets you access existing notifications, as well as Favorites. If you need help in the notification game, grab Hooks right now.